Summer 2013 needed a soundtrack. Thankfully it’s Neil Tennant and Chris Lowe to the rescue. Thirty years into their career as the preeminent gentleman of pop and conveyors of all that is witty, heartfelt and occasionally tongue-in-cheek under the strobe light, Pet Shop Boys are about to release their 12th studio album, Electric. For production duties, the UK duo enlisted fellow Brit Stuart Price — yes, the man behind Madonna’s Confessions On A Dancefloor and a dozen other pop gems from the past decade. The result, dare we say it, is the pair’s most banging album since 1993’s Very. What brings you two to Los Angeles? 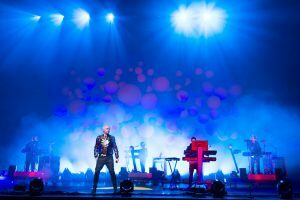 NEIL TENNANT: We’re just in LA for two days before going down to Chile. Our manager also lives here, so we’ve been meeting with her on a few other things. We’re about to start a South American tour on Monday, and we go to Argentina, Colombia, Brazil and Paraguay. The Electric Tour hits the States in September. I caught you twice last time around, on the Pandemonium Tour, including the date in Italy with Take That. NEIL: Oh, in Milan! Yeah, that was fun. Do you anticipate this jaunt lasting as long as the previous one? That tour stretched on for three years. NEIL: Yeah, well, we’ll see! The Pandemonium Tour was officially going to take two years. But then the Take That thing happened. You know, sometimes you just get offers to do festivals or to do certain gigs, and so we’re happy to do that. Let’s discuss the new album, Electric — which is coming out on your own label, x2. Chris, do I understand this correctly, that you came up with the name, x2? CHRIS LOWE: Well, actually, we didn’t think we needed a label. We hadn’t really thought about it. And then we suddenly had to have one. We came up with a few ideas. Can’t think of what they are now. But I like DSQUARED2, the clothing label, and I thought, ah, DSQUARED2 — and there are two of them; they’re twins. So I thought, what would the Pet Shop Boys’ version of that be? I thought maybe x2. I put it on my iPhone and it had a very nice simplicity to it. It looked very elegant with the “x” and the “2”. So the exciting thing is having a new brand, a new label. And we want to do different things with it — not necessarily music-related. Your previous album, the beautiful Elysium, was only released last September, and yet here you are with a brand new record, out in July. This is like a feast for all the Petheads out there. NEIL: It’s kind of a remarkably quick turnaround after Elysium. But we feel really excited about that. When we go out on tour, which starts Monday, we’ve got two new albums to play songs from. And also, I think, with our new label set up, we feel the freedom to do what we like. I think that’s a very important freedom for us. When you’ve been making records for a long time, it’s great to suddenly feel that you can do things and not necessarily always worry about radio play or whether the music industry finds it a bit strange to release two records in a 12-month period. And we can do that! So it feels like a great, free time for us. In your video for the Electric teaser track “Axis,” it appears as if the orange cone hats are back. Is this a wink toward Very? CHRIS: A lot of that is video projections from the latest show we’re doing. The designer, Es Devlin, who we’ve worked with before, wanted to reference some of our older stuff. But also, when we appeared at the closing ceremony of the Olympics in London, they wanted us to wear those pointy hats. They’ve become part of our iconography now. They’re black, though, not the orange ones, so they’re slightly different from Very. NEIL: The Very ones were actually made of cardboard, or paper, even. Gareth Pugh made the ones for the Olympics. And the ones we wear for this tour are much more designer. Electric is a very “up,” nine-track album produced by Stuart Price, and it plays like the perfect record for summer. CHRIS: The main thing about working with Stuart is it’s just a lot of fun in the studio. There’s a lot of laughter and a lot of chatting. He works very, very quickly, which we always like with people. It’s never boring working with Stuart. He’s the perfect collaborator for us. The new single, “Vocal,” undeniably has you two getting back to the dance floor. NEIL: It genuinely sounds like a dance anthem. And also, it was a challenge writing the lyrics to a song about being on the dance floor without being cheesy. I’m really proud of the lyrics. I think they’ve got a lot of poetry about them — you know, “aspirations for a better life are ordained.” Sounds positively biblical! [Laughs] I think it’s a lovely song. It’s got a joke in it — which actually slightly dates it, because dance music has gotten more vocal recently — about having every track as a vocal, and that makes a change. So much dance music is instrumental. Looking ahead, you’ve been working on a project revolving around the life of Alan Turing. How did this come about for you two? NEIL: Chris saw a documentary on television about Alan Turing. He was, for people who don’t know, an English mathematician and inventor and code-breaker, and he invented what is now the modern home computer —the universal machine, which is one machine that would solve every problem. During the second World War, he had this big team that broke the Enigma Code, so they could find out what the German submarines were doing in the Atlantic. He very much helped to win the war. But also, he was an open homosexual. He used to tell people that he was a homosexual, which was illegal in those days and very shocking for people. He was very, very direct about it. He ended up being prosecuted for that and going to court. As punishment, they didn’t send him to prison, they gave him injections of female hormones. And as a result of being found guilty of gross indecency, his security clearances were withdrawn. He became depressed and he killed himself. What a horrible end for a man who was essentially a pioneer and a war hero. NEIL: He died and still remains a guilty man in the eyes of the law. Anyway, this film that Channel 4 made was very moving. We both read this biography by an Oxford professor called Andrew Hodges, who wrote this in the early ‘80s. He came from two directions: one, he’s a professor of mathematics, and two, he was a gay rights activist in the 1970s. Both of those strands came together in this magnificent biography. And that’s why [our] piece is called A Man From The Future, because [Turing] was credited as the inventor of the modern computer. Also, he was openly gay, which was an extremely difficult thing to be in those days. He was also looking forward to how things would be in the future. This piece is structured as eight different scenes in the life of Alan Turing, and it’s a spoken-word, electronics orchestra. We actually premiered one of the pieces when we did a concert with the BBC Philharmonic last year. It was called “He Dreamed Of Machines.” We went through Andrew Hodges’ book and took just phrases, really, to indicate what was going on at a particular time. That phrase, “He dreamed of machines” — which is beautiful, I think, for a piece of music — came from Andrew’s book. So that’s kind of an indication of what it’s like. Thank you both very much for the chat. Looking forward to catching you on the road this fall! NEIL & CHRIS: Thank you!